T.S. Eliot noted that April is the cruellest month, but I think this honour goes to February. The days are beginning to draw out but the air still carries a bitter wind; the gardens are mostly bare and the bird-feeders are a vital lifeline. My oldest friend lost her father to cancer last week, a cruel end after a lifetime of hard work. Now isn’t the time, but in future weeks I will write a proper Veg Patch tribute to Mr Russell, professional baker and creator of the finest jam doughnuts and memorable apple and almond slices. His presence enriched many lives; his absence still too quick and sad to fully absorb. There’s just time today to record a recipe that’s become a go-to Saturday Treat in the Foster-Stallard household. Bavette steak can be picked up for a song (these two enormous pieces were less than £5 from Waitrose – compare that to the more normal fillet and rump…) and carry SO MUCH FLAVOUR. Honestly, once you’ve gone bavette, you’ll never go back. Bavette steak. Notice the fibrous texture of the meat. There’s some disagreement online about what the bavette cut actually is. 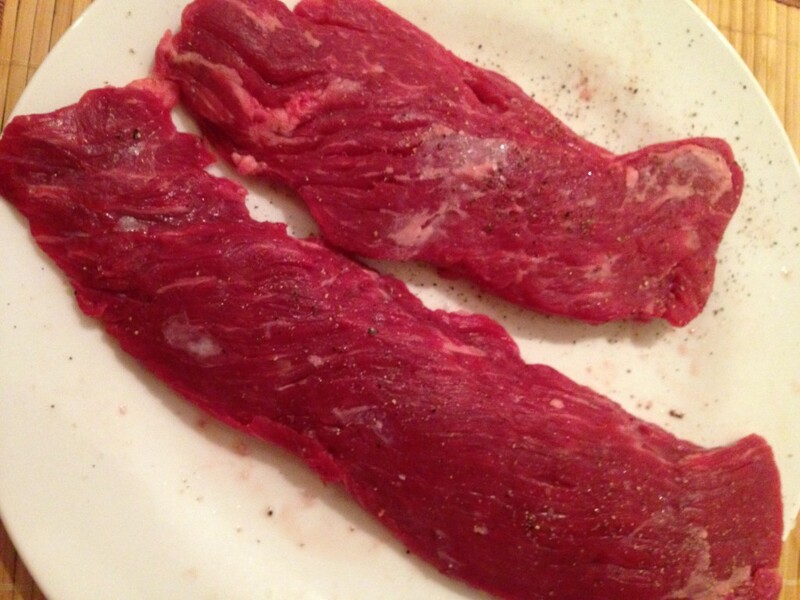 British sites tend to say that it’s the same as skirt steak, whilst American say it’s the flap underneath the skirt. A few years ago I was in a country bistro in the Languedoc where they served up a beef cut called onglet, and I’m pretty certain that that was the same as bavette, which just confuses things even further. Either way, this piece of meat comes from around the gut of the animal so it works hard. The outcome is meat that tastes good, but is also quite fibrous…that’s the chef’s term for chewy. 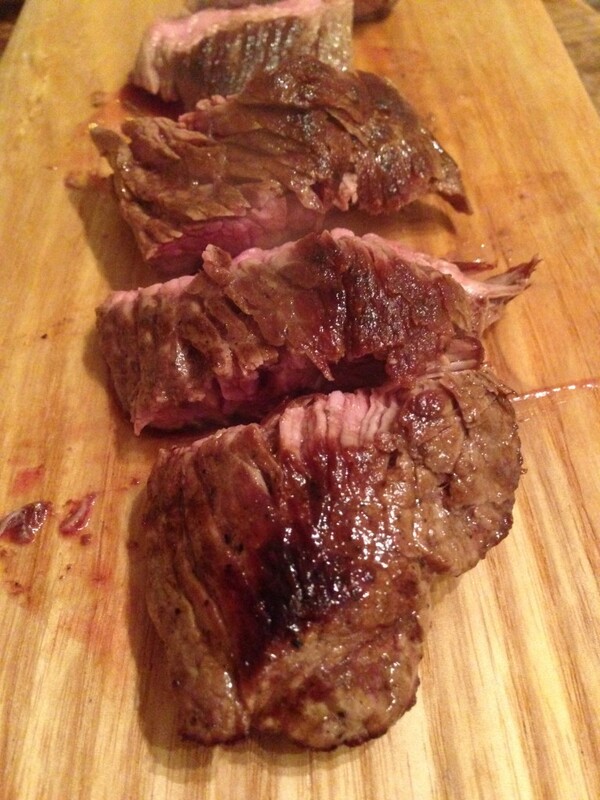 Now, I happen to quite like a chewy steak…but bavette does need to be cooked just-so. So once you’ve got it home, make sure it’s dry by patting with kitchen roll, and leave it out of the fridge for a few hours to come to room temperature. When you’re ready to cook, anoint it with a little olive oil, season well and sear on a super-hot dry pan for about four minutes each side; we use a heavy cast-iron frying pan for this. It’s important not to prod or move it during this time, so that a good crust can develop on the outside. Flip and repeat on the other side, then leave to rest for five minutes before serving. It needs to be on the rare to medium side; over-done and you’ll have a piece of rubber on your plate. Usually we go with a classic béarnaise sauce but on Saturday I whisked up a chimichurri using Frances Mallmann’s recipe. Mallmann is Argentina’s foremost chef and I’ll probably write about him and his take on cooking-with-fire another day. For now though, suffice to say that chimichurri is made by melting a pinch of sea salt with two tablespoons boiling water, then adding a fistful of chopped fresh oregano, the same of parsley, two cloves of finely minced garlic, a splash of red wine vinegar and extra virgin olive oil and the merest sprinkle of dried chilli flakes. Make it an hour or two ahead to allow the flavours to mingle. The chimichurri is fresh and punchy and lifts the steak to new dimensions. In Argentina it’s used as a marinade, a basting device and a dipping sauce; I get the feeling that after steak, it’s their national dish. So slice the steak, top with chimichurri and enjoy a savoury, chewy, deeply satisfying and immensely affordable treat. 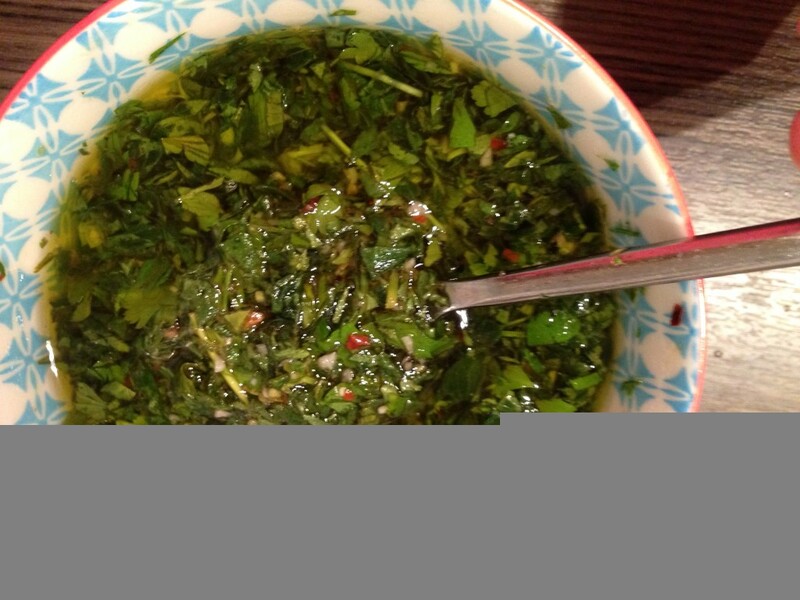 This entry was posted in Recipes, Savoury and tagged bavette, chimichurri, Frances Mallmann. Bookmark the permalink.